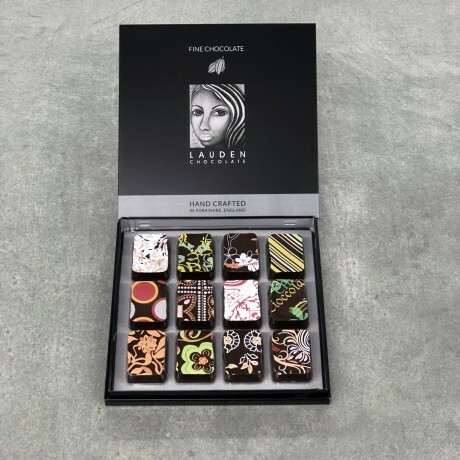 Tantalise your taste buds with this chocolate box featuring the 12 stunning core flavours that Lauden have become known for. Fresh mint - with real mint leaves for a full, invigorating flavour. Perfect for after-dinner. Lemon - The perfect marriage of white chocolate with the zingy acidity of pure zesty lemon. Blackcurrant & Redcurrant - fresh blackcurrants and redcurrants with seductive dark chocolate, this is heaven for berry lovers. Marc de champagne - an indulgent classic, made with real Marc de Champagne. Salted caramel - Fleur de sel from the French ocean brings out the flavour of homemade caramel, surrounded by dark chocolate. Passion Fruit - real passion fruit combined with chocolate for a clean, tangy and exotic taste. 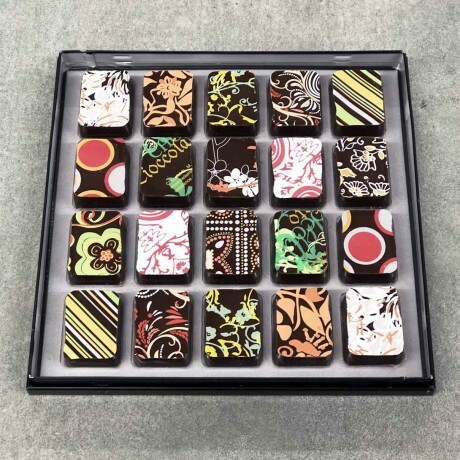 Lime - Sharp lime complements dark chocolate perfectly, fresh and tangy. 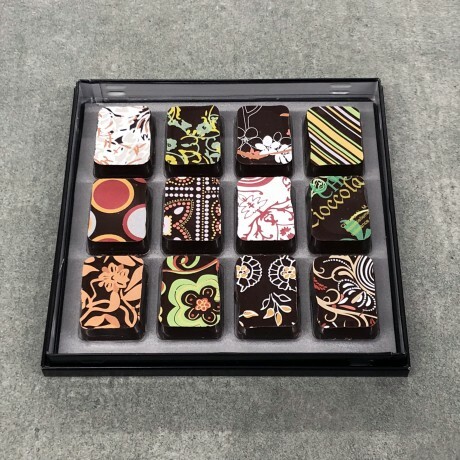 Sour cherry - Bohemian sour cherries combined with dark chocolate to create a unique taste experience. Lychee & Rose - East meets West in this aromatic and luxurious blend of sweetness and floral notes - a beautiful combination. Raspberry & Rose - The taste of an English summer, a pure and fragrant pleasure. Mediterranean Orange - made using whole organic oranges including peel, juicy and refreshing. 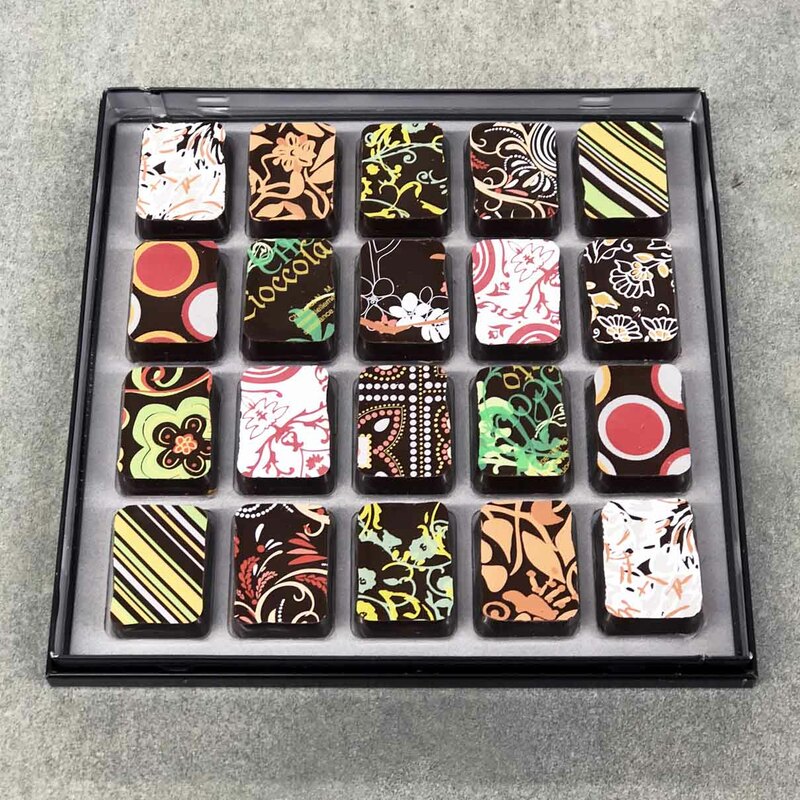 Choose between a box of 12 of a box of 20 chocolates.